The Fluid 2.0 has a sleek slimline shape that is perfect for stand-up paddlers. It is less bulky, easier to repack, and more comfortable to wear with its 3D mesh padded comfort panel and soft waist belt with buckle cover. 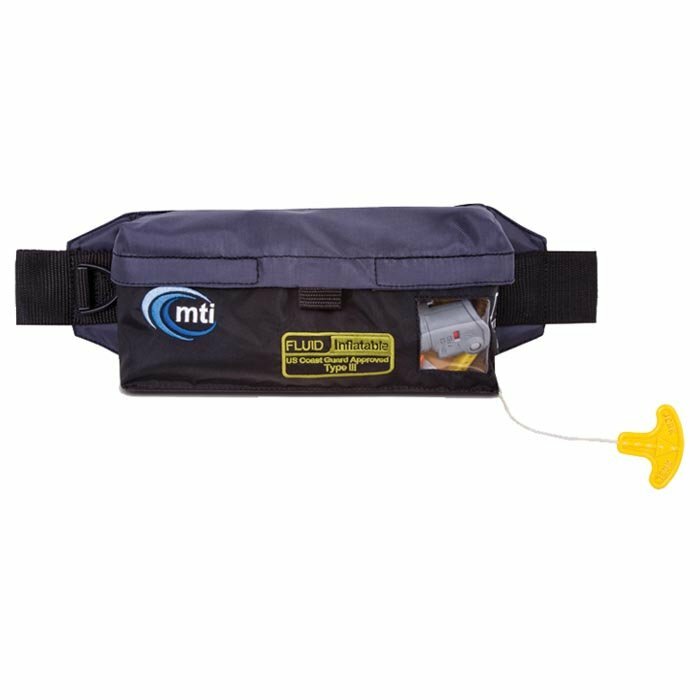 Pull the cord and the CO2 cartridge immediately activates, releasing a life jacket from the pouch. Just put it on over your head, it is tethered to the belt pack around your waist so it won't float away. The Fluid 2.0 packs are type III USCG approved life jackets so it’s legal either worn or carried on board. Size: Adult Universal (30" - 52"). Min. buoyancy: 26 lbs. 2 oz. User weight: More than 80 lbs (16 yrs and older). Standard Fluid: Pack is for everyday recreational use and includes a handy zippered pocket, reflective trim, signal whistle, and CO2 cartridge. Race Fluid: Pack is targeted to flatwater SUP racers. In addition to the padded 3D mesh panel, the waist belt has a multi-loop attachment point system designed to carry items like clip-on water bottles and navigation aids. Whistle and CO2 cartridge included. OM Fluid: Pack for SUP Yoga. Developed with SUP TV fitness trainer Jodell Fitzwater, the OM Fluid includes a mini-biner. Wear the pack around your waist paddling to a SUP Yoga class and then clip it to your board during practice.